OMG India, International Email Provider in Delhi: Best Bulk Email Service Company in India offers best Email Server. International Email Marketing : Engage More Customers Easily‎ and manage new customers World-wide! OMG India, International Bulk Email service provider, offers the best combination of domestic and international Email Services with powerful Email Marketing Interface which includes Best-In-Class Delivery, Full-Featured APIs, Real Time Reports, Quick & Easy Setup options. We serve almost every country to deliver mails by having the classical International Email Gateway and connectivity with global server. OMG India is India's No.1 Email Marketing Service that offers customers to send mail worldwide by upgrading their email account. For this customers don't have to install any email marketing software or configure mail server. It is inbuilt feature that we offer to our customers. 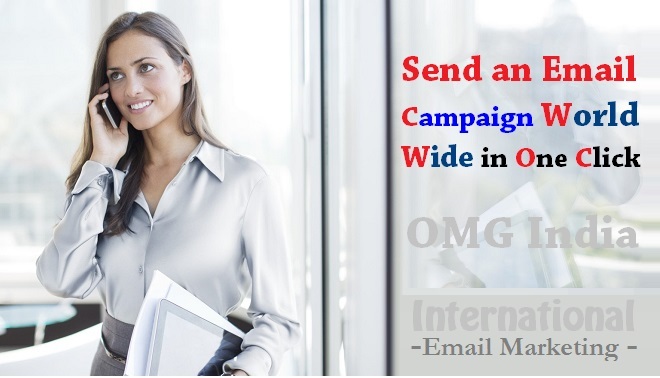 Join OMG India, India's leading international bulk emailing service provider to email to your international customers from anywhere anytime and also track the email statistics reports after completing the campaign to analyse the campaign data for better experience. International Email Marketing Service Provider in India ! OMG India – Bulk Email Marketing Agency is one of the very entrenched, widespread & standard International Email service providers in Delhi offers Best Email Delivery Solution which includes 100% Cloud-Based • Speed up Abuse Detection • Eliminate IP Blacklisting • Smart Host Service. We also include Outbound Email Filtering, Blacklist Monitoring, SMTP Relay Service in our powerful Email Interface. One of the best part of our Email Interface, we offer inbuilt Spam Filter option where you can easily filter your email campaign from spam keywords. Create, Send & Track Effective Email Campaigns with OMG India. Generate More Business & Leads‎. -- Sign Up Now to Get Started Today ! E Mail Marketing Agency - Send an Email Campaign at World-wide in One Click ! OMG India has come out as the world's most fastest-growing Digital Marketing Agency over the last few years. OMG-INDIA was recognized with a mission is to get tremendous ROI on your investment to increase your client's base beyond your thinking and generate remarkable sales for your business.